Hi! How has it been December for several days already? Someone please help me better understand the passage of time. It’s fine though, because barreling toward Christmas at this crazy pace means we get to keep making party food and ignore regular meals, right? I do have a few of those coming up for you, but peppered in with snacks and drinks and desserts. 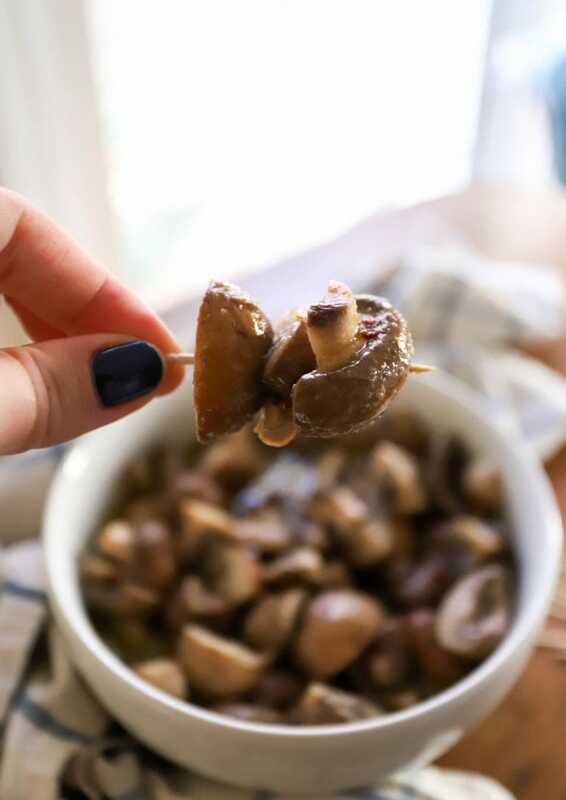 These mushrooms in particular will always and forever remind me of Christmas, even though my family never had them. I think this is a total throwback recipe, 80’s or 90’s or something – did you eat these as a kid? My next door neighbors in Japan made these for almost every holiday, and I LOVED them. 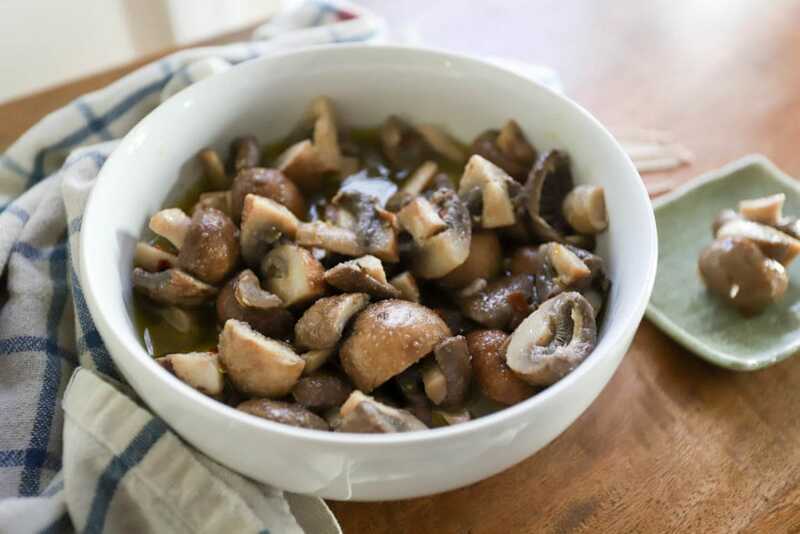 I think they used Italian dressing and canned mushrooms, no shame in that game, and the chewy mushroom in the tangy vinaigrette was just my favorite thing ever. I’m all about anything tangy or pickled, and I think these are such a great addition to a holiday party. They’re so light and bright and a perfect complement to the heavier dishes that we have this time of year. They take literally 15 minutes to make and can hang out in the fridge for several days, so the ease-factor is huge here too given how crazy busy we are this time of year. 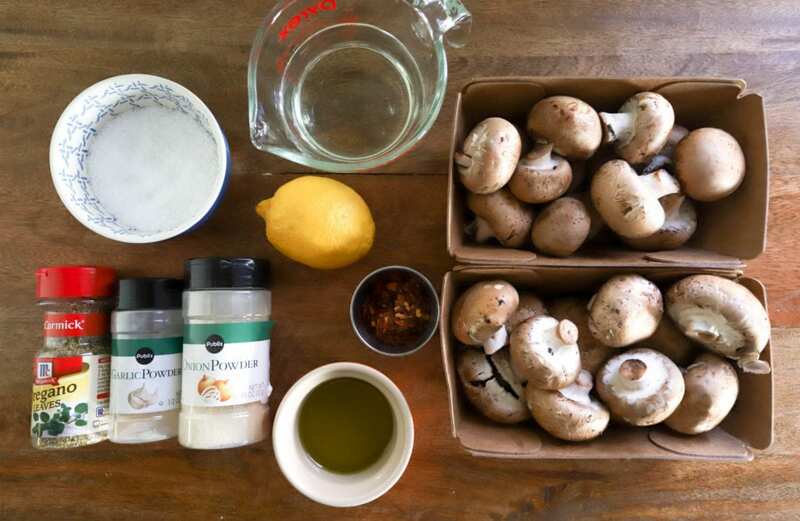 You need mushrooms, duh. They get boiled in water and white vinegar. Then the marinade is lemon juice, olive oil, crushed red pepper, salt, garlic powder, onion powder, and oregano. So simple and flavorful! When I was researching recipes for this I saw a bunch of methods that used fresh garlic and herbs and involved a lot more steps. I think those things would be delicious too, but these were phenomenal with just pantry items. 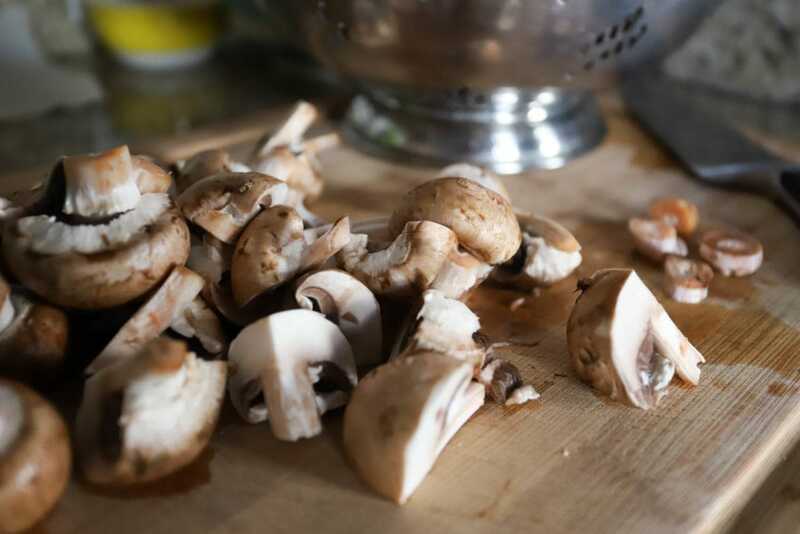 First, bring the water and vinegar to a boil and cut the mushrooms into bite-sized pieces. I left smaller mushrooms whole and cut the rest into halves or quarters so they were all about the same size. 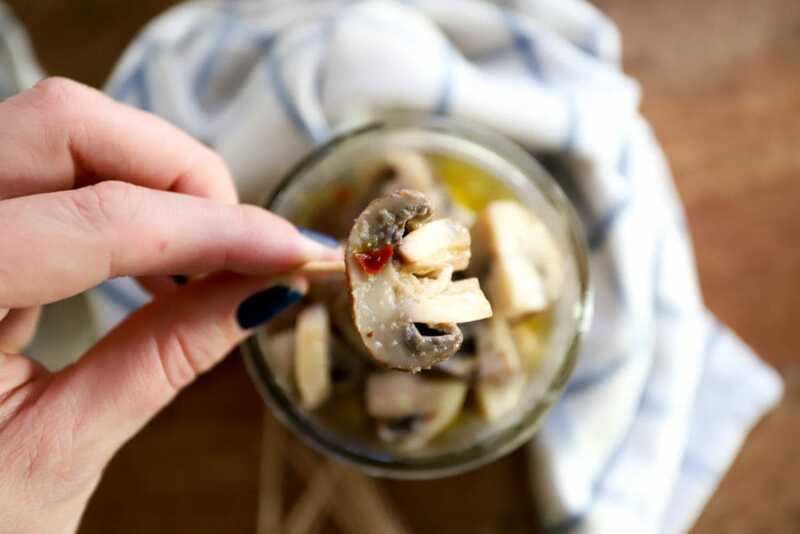 When the water and vinegar boil, add the mushrooms and let them boil for just 3 minutes, then drain them and let them sit while you make the vinaigrette. 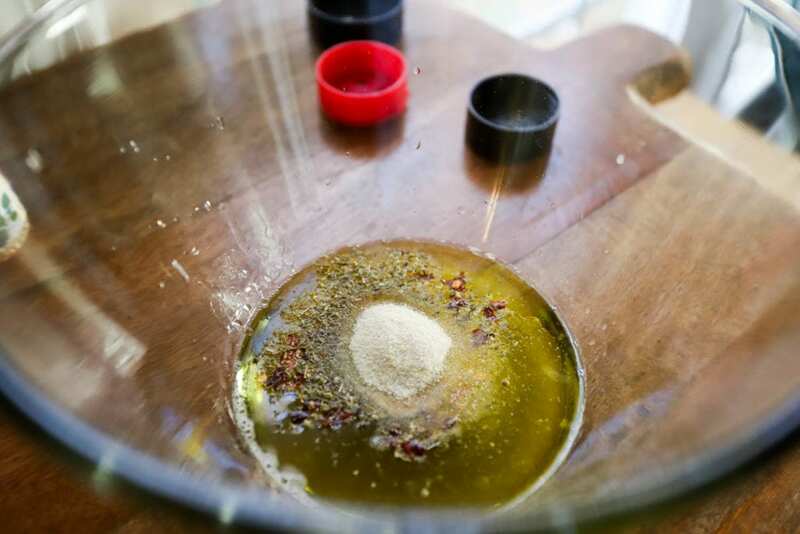 Whisk everything together in a bowl, and make extra – this is a great salad dressing! 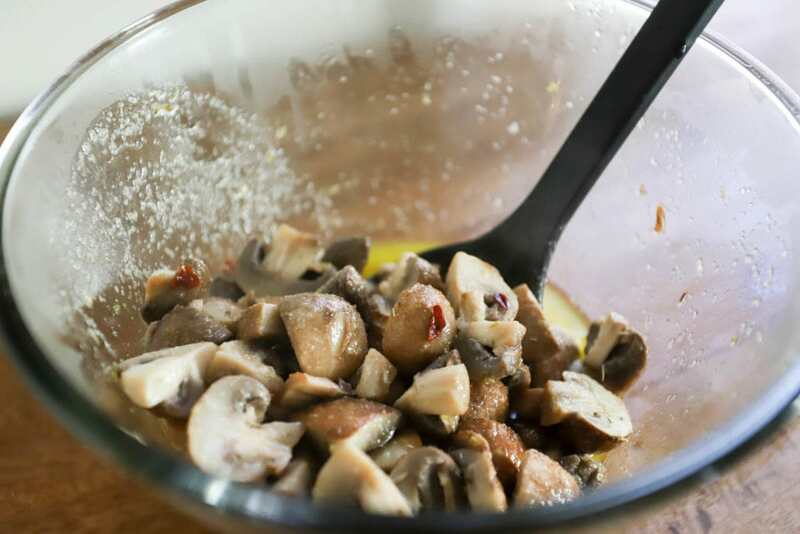 When the marinade is done, add the warm mushrooms to the bowl and stir to combine. That’s it! These are delicious right away, served warm or at room temperature, or you can keep them in the fridge for a few days until you’d like to serve them. I’m all about these on salads, for snacking, and as part of an appetizer table at a party. 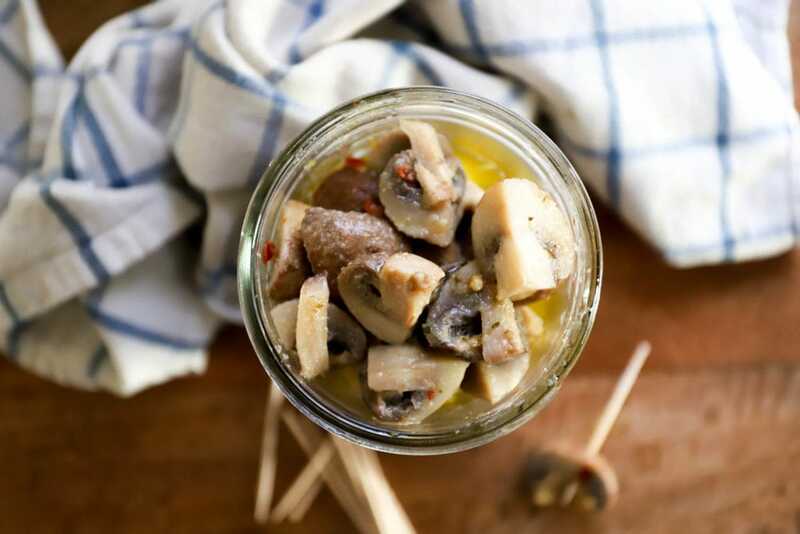 The flavor is just SO good, and I wouldn’t hate getting these as a gift in a pretty jar either – but maybe a jar of mushrooms as a gift is a little much for some people. Try these in the coming weeks. They’re very merry! In a medium pot, bring the water and vinegar to a boil. 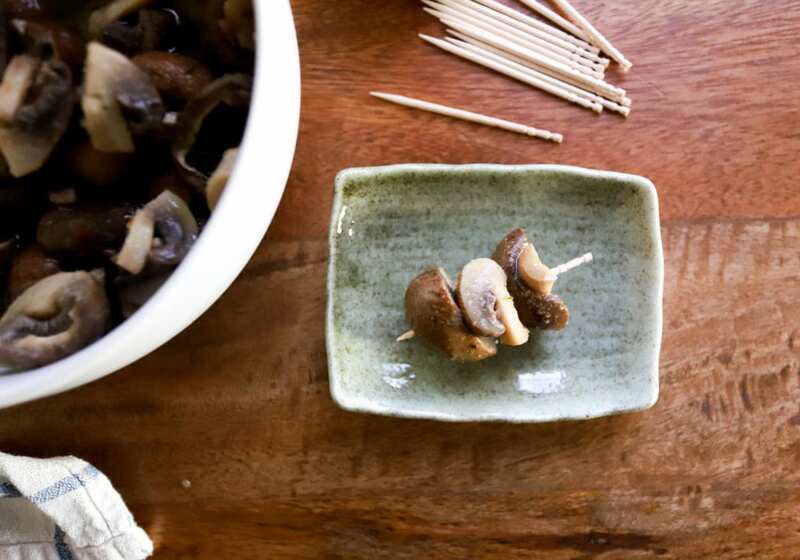 Boil the mushrooms for 3 minutes, then drain and set aside while you make the marinade. In a large bowl, whisk together the remaining ingredients to make the marinade. Add the mushrooms, and stir to combine. Taste, and add a few more pinches of salt if you'd like. These can be served right away or kept in the fridge for several days.